This morning, rock band Panic! at the Disco announced their new single “Miss Jackson” via twitter, linking to the song’s music video on their tumblr. “Miss Jackson” is a haunting, darkly ambiguous theme about a girl and murder. The chorus isn’t very verbose (mostly consisting of the phrases “Miss Jackson,” “Are you nasty?” and “But I love her anyway”), but it’s catchy as hell. Guest vocalist Lolo’s refrain adds a creepy, almost music box-like feeling to an already uneasy melody. This single is a little heavier on the instrumentation than previous Panic! singles, making the backing sound slightly reminiscent of Fall Out Boy’s recent “My Songs Know What You Did in the Dark (Light Em Up),” but is quite different when it comes to the vocals and subject matter. 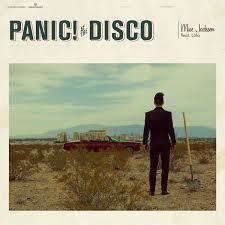 “Miss Jackson” is an intriguing introduction to Panic!’s newest album, and I personally can’t wait to hear more. The music video opens at a seedy Las Vegas motel in the middle of the night, where spiffily-dressed lead singer Brendon Urie appears to be descending to madness. The video flashes back or speeds forward to reveal a mysterious girl in a headdress who appears to be sucking the essence out of those around her, along with Urie’s bandmates Spencer Smith and Dallon Weekes. There’s a bit of beheading before the video returns to where it started. Of course, the video also features a giant light up exclamation point, which I thought was a nice touch. The tumblr post also announced that the follow up to their 2011 album Vices & Virtues is titled Too Weird to Live, Too Rare to Die and will be available October 8th. Their fourth album will harken back to their Las Vegas roots and is about being proud of being unique, as referenced in the title. Have you heard the new single? What do you think? Next ArticleChoke Giveaway: Win a $50 Amazon Gift Card or Paypal Cash!